The African Peacebuilding Network (APN), in collaboration with the Institute of Peace and Security Studies (IPSS) of Addis Ababa University, Ethiopia, held its second training workshop for the program’s 2015 cohort of individual research grantees and residential postdoctoral fellows. The event, which took place December 2–4, 2015, focused on the writing and dissemination of grantees’ and fellows’ project findings. Through a series of presentations and one-on-one interactions with experts in the field of peacebuilding, participants were given practical skills to translate their evidence-based research into high-quality, peer-reviewed publications following their six-month fieldwork and three-month postdoctoral residences, respectively. Emphasis was also placed on making that knowledge easily accessible to various scholarly, policy, and practitioner communities at the national, regional, and global levels. Participants were exposed to various platforms for sharing their research, including mainstream and new and social media, and encouraged to present their knowledge in such ways that can easily be consumed by various publics. The event was also open to several PhD students from IPSS. Lectures were given by Professor Gilbert Khadiagala (University of the Witwatersrand), Professor Said Adejumobi (Economic Commission for Africa), Professor Kenneth Omeje (APN 2013 grantee, University of Bradford), Dr. Duncan Omanga (APN 2014 grantee, current Cambridge fellow), and Dr. Charles Ukeje (APN 2014-2016 collaborative working group grantee, IPSS), as well as APN advisory board member Dr. Devon Curtis (University of Cambridge). Presentations engaged participants with a critical understanding of the context and politics of the conflict and peacebuilding nexus in Africa, and how best to promote their findings within such an expanding network. The lectures were given by leadings scholars and experts in African peacebuilding, many of whom serve on international and regional peer-reviewed journals and other publications (as either editors or editorial board members) and are experts in digital communications. Topics covered included the changing dynamics of conflict of Africa, the gaps in African peace and security research, strategies for disseminating research in peer-review publications and social and mainstream media, and how to transform research findings into policy inputs. The presentations were followed by question-and-answer sessions and lively debates among participants. The issue was raised over producing research that is “problem-solving oriented,” versus “policy-oriented.” As Prof. Omeje remarked, “It is important to use research to highlight policy gaps, and know what the current policies are, if any at all.” He also stressed the importance of publishing in Africa, not just Western journals and book publishers. Dr. Ukeje went further to say that, “We need to understand the nature of research, and we need to understand the nature of policy.” Not only must researchers be “cutting edge” and aspire for brevity when writing for policymakers, but he also encouraged others to “think critically of what our role should be as scholars in the developing world.” Meanwhile, Dr. Omanga commented on the fact that “As academics, we can’t underestimate the importance of social media in disseminating our work, but also for cultivating research.” He spoke to the uses of social media, blogging, and op-eds, and other ways one can make research visible to multiple constituents. 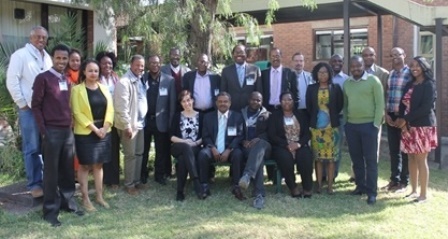 The cohorts—composed of junior, midcareer, and senior scholars and practitioners working across various institutions and universities in Africa—also had the chance to interact and further develop working relationships with one another, while also exchanging ideas within smaller training groups facilitated by key resource persons. These smaller groups allowed participants to crystallize their ideas about publishing their research results (i.e., where and in what form) and get constructive feedback on their draft publications through group and one-on-one consultations with trainers. Overall, participants felt the mentoring they received to be useful and informative, and they left the event feeling excited by the prospect of their research being translated into material that could be used to influence policy. Going forward, the APN hopes participants will use the networks they have cultivated to further collaborate on peacebuilding projects, and possibly compete for publishing awards and other scholarly endeavors together in the future. A presentation was also made by IPSS director Mr. Ato Kidane Kiros, who focused on the Institute’s main areas of expertise and work on education, research, and outreach. Attention was paid to the IPSS’s involvement with the Tana High Level Forum on Security in Africa, as well as its executive Master’s in managing peace and security in Africa (MPSA) and the African-centered Solutions (AfSol) workshop series. APN also worked with IPSS to coordinate a visit to the African Union, where participants had a firsthand exposure to the inner workings of the AU’s peace and security and political affairs offices. Presentations were made by Taye Abdulkadir and Dr. Kwaku-Asante Darko. These speakers focused on the objectives of the AU, the African Peace and Security Architecture (APSA) and its core components—including the Peace and Security Council—and the protocols and frameworks of the Continental Early Warning System (CEWS). Participants then paid a special visit to the Situation Room, which is a special feature of the AU and operates on a 24/7 basis, allowing analysts to quickly monitor, gather, and assess information across Africa on dynamic indicators of conflict, structural indicators, and country profiles. A data tool that quickly visualizes country situations in real-time, the Situation Room produces daily reports as well as weekly updates and flash reports. AU staff emphasized the role of academics in publishing books and journals to help inform the policymaking community, stressing the need for more bridges between policy and scholarly communities. They also spoke to the gaps in knowledge that need to be addressed in order to help policymakers tackle peace and security on the continent, such as cyber-terrorism, climate change, China, and maritime security. The APN wishes to thank IPSS and the African Union for ensuring a successful event.